It was a great pleasure to interview Mike, the drummer of Moonspell, over the phone. Engaged, enthusiastic, talkative and as he himself described “Latin in style”. Unfortunately we only had a limited time to talk, but he was still able to enlighten us on several interesting things about Moonspell and their future. Read for more details on their newest album, “MEMORIAL”, coming out this month. Also read more to hear about their break with Century Media, their general change in musical style, and their great respect for the danish fans, as well as a genuine wish to return to Denmark and in particular the Roskilde Festival! RF.net: Flippin’ through different reviews and descriptions of you, you seem to be pinned with quite a lot of genre-tags: Doom-metal, Goth-metal, Goth / Death / Black-metal have all been mentioned. How would you describe your music yourself, and which genre would you label yourselves under? Mike: Well it's always difficult to categorize the music you do. It's like trying to describe to people you don't know, or friends, your personality. I think it's always difficult. What you think of yourself is sometimes a different image you give to the people, or people don't always understand things in the same way. Of course we try to understand each time better through communication, such as making music in a room and thinking that it's great and that it's this and that. And then not interacting with other people, from our friends to people that know music. I think we ought to learn what people expect or think of Moonspell. Our influences started with really strong bands like Bathory, one of the best bands ever from Sweden! They have influenced most of black metal until this day. RF.net: Well actually that was gonna be my next question. Which bands would you say have influenced you the most and why? Mike: Well yes the thing with all these bands is they influence you. There is always a part of you that you always put in the music and sometimes you can hear bands where you say “oh this is a rip-off of this and rip-off of that”. You know unless you do it mechanically the same way, like a cover band, then it's just influence. RF.net: If someone said that you were “Nightwish #2 only with a male vocalist”, what would you say to them? Nightwish with a male vocalist... Well, I don't know how long they've been around, but of course they've had a lot of success lately, because of them having a female vocalist. Of course I respect their work and seeing their name and their records all over Finland. We haven't gotten to meet, but I think that we have nothing to do with each other. RF.net: You have cooperated with a ballet company from Portugal and have been involved with the making of the OST (Original Sound Track) for one of Portugal’s best horror movies. Can you explain and give your thoughts on why you ended up doing these activities. Mike: Well, here in Portugal we do as much as we can to be in contact with different projects. We worked with the writer, who helped us making lyrics that would fit into the theme of the movie, so it was great making a soundtrack for the first horror movie made in Portugal. It was actually quite an experience to sit in the room with a person who had won the Nobel prize. I remember saying that he had talked to those who knew us: "Oh it's my dream to have them make a song for this movie! ", so they called us and we worked together along with them. We recorded in our own studio, because there wasn't much of a budget and it was very low cost. So we did the best that we could on this cover song called ”I'll see you in my dreams” and I think it's a jazz song from the twenties that has millions of versions, so we stuck to that and listened to it and we tried to make it jazz. The good thing about it was that the guy was impressed and appereciated our work. He loved it. In fact, some months later, he did the video for us. So we had a great time during the video you know, with zombies and the masks along with all the blood. Some were actually trying to eat us in the video. RF.net: Before we start talking about “Memorial”, I just have a few questions regarding your old albums. Do you feel that "Sin/Pecado" and "Butterfly FX" albums are overrated, like the general ‘buzz’ on the internet seems to be? Why do you think the fans don’t seem to like these two albums as much as the other ones? Mike: ...It's not weird, because at the time they came out they were very criticized and not understood at all. A lot of fans bothered us with questions like: “Why do you play that kind of instrument on Butterfly” etc. and it made us quite confused since normally when we wanted to play songs a lot people were interested. Some said that it would go better with the new than with the old, but people just have some basic instinct to define, go against or have an impression and they should be allowed to have their own opinion. RF.net: Okay, so Moonspell has been around since 1994, and you’ve been on Century Media until now. Was it a friendly good-bye? Why did you decide to leave the label for another one? Mike: Well, we had more than ten years with them, bringing us six albums so we're connected to Century Media for life. RF.net: You are now working with SPV Records but Century Media will release a Moonspell DVD titled "Lunar Still/13 Years of Doom" later in the year. How do you feel about your old label still releasing material from you. Will there be a problem with royalties and stuff like that? Mike: There's a lot of bands who get upset and goes against this, but we see it as them wanting to keep a good relation and support these releases. The most important thing for us is always and has been the same from the beginning, is what comes out in our name regardless if it's a DVD or a special box, will still be viewed by the fans as our work. Fans don't distinguish between the record label and don't understand that a band has switch label and so we wish to still cooperate with Century Media rather than have releases from them that we have no influence on. RF.net: “Memorial” has been described as being a record where Moonspell returns to their roots after having experimented with electronic stuff on their last couple of albums. How valid do you feel that this statement is? Mike: It's been a connection between the feelings and the image, but at the same time it's like a bit empty when you think of it. We've been around for nearly ten years and spend time with a lot of different music on the albums, so we hope that people can see that this album has a lot coming from our roots, but is very very modern in the terms of sounds and still it is very exquisite and unique composition. The keyboard and atmosphere is like the best I've heard in years. RF.net: “Memorial” has some very good production. One of our writers even expressed that it was the best production he had ever heard. How were you able to work with your producer so well to create such a crystal clear sound, while it’s still just as dark as a band like you needs to be? Mike: This is a very old school album. In the studio we did a lot on the vocals and we rehearsed like animals. Before the album, we did three pre-production with Valdemar in Portugal. When in Portugal we did it in three different parts, so he could work with us on the songs. RF.net: I understand Fernando has been doing clean singing on some of the recent albums before “Memorial”, but he has now returned to the growling/screaming almost the entire time. How come you decided to drop the clean vocals and change your artistic direction around? Mike: Fernando is actually very impressive when he screams and growls in studio, because it gets very loud and very scary and he's always perfectly fit for it. It's like the easiest thing for him to do. He doesn't have to think much, he just opens his throat and he screams. So that's what I think we wanted to capture on this album, you know the most natural emotion possible from each one of us. RF.net: What has been your favourite tour to date and why? Also, which show can you recall as being the best show for you? Mike: Well, the one that I remember the best was the “Quest for an Angel” tour, which was our first. We did seven weeks in a van and had to do a lot of things ourselves. We were the roadies and the technicians along with selling merchandise and driving. So that was just an experience of the best. I was like 20 years old and we had just released our second album and were playing with Type O-Negative in front of a crowd of 5000 people. That was like the most successful tour for us in Europe and Type O-Negative is one of the bands that we respect the most and have befriended. RF.net: What has been the most bizarre/craziest thing that has happened to you guys on stage? Mike: Well, there was this once were we got covered in baking flour. But that was more disgusting you know, it was all sticky and such. Another story was once in Poland, where we were playing and we only had our freaking van to sleep in and it was like freezing, so we would've got very sick and maybe killed if Fernando hadn't been good at yelling and making a lot of noise until we eventually got let in by the old woman taking care of the motel. RF.net: You have a guest appearance on Portugal's Assemblent's debut album "Equilibrium" on one song. Are these guys long time friends or a band that you want to support? Or what's the story behind this guest appearance? Mike: Ahh...Fernando is like a social worker for metal bands in Portugal. He helps them with their albums, but eventually he ends up having a lot of work to help these guys along. But that's just one thing that makes Fernando special, because he's always willing to participate into being part of something. He's also working very hard in getting a better image for the band, not only here but also abroad. RF.net: Given the artistic change on “Memorial”, what do you think will be the musical direction you’ll be taking on your next album? Mike: Well, it's still under construction. After “Memorial”, the most important thing for us is to work on some new stuff immediately. We're always getting better and better, because we try to go to the rehearsal place every day just to get some new stuff on the computer. Fernando is like 24 hour busy with Moonspell, like always doing interviews and such. I, myself have also been very busy doing interviews, helping out, and practising on drums. I don't compose, but I try to practice in keeping my skills, my level, and my strength up as much as I can. 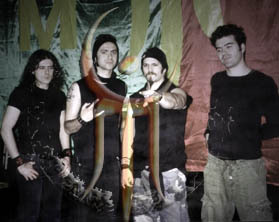 RF.net: Where will we see Moonspell touring during 2006. Will we see you coming to Denmark? How about Roskilde Festival? Mike: We haven't played at Roskilde since '98, but it was one of our best festivals in our lives. It was so fine, when we were going to play in one of those big tents holding maybe 10.000 people, they we're vacuum cleaning the big red carpet on the stage. It looked like some kind of hotel where they we're cleaning your living room or something. I will never forget that. Also the treatment and the respect you have for everybody from the technicians to the local people, really made us notice the small things. You know, back in Portugal it is just like a dream to have such a festival. Anyways, we're trying to play at as many festivals as possible We're playing in France next week where we are headlining the festival. We're going to play along with Hypocricy and Amorphis I think, so that's going to be fun. We haven't headlined in a long time at festivals. RF.net: Finally, do you have any extra funny stories to share with your fans, that you haven’t already shared? Alternatively, do you have anything you wanna say to your fans before we close this interview off? Mike: Some story... Well our first experience in the United States was very American! We thought that we were perfectly prepared for it all, so we played at this metal festival in Texas and there was this big, big guy who showed up to pick us up. And Fernando said: “Take us to the sleaziest diner you can find”. So he took us to this really, really sleazy restaurant where the chicken was fried so you could see it was burned and the waitress was like really dirty. It was a very, very sleazy place, but the chicken was actually very tasty. It was a real culture shock for us, when coming from Portugal. because at the festival there was this wrestling ring where there was these guys wrestling while we played. At the stage where we were playing there was another stage just next to ours, only with a curtain between them. So two bands played at the same time and there was this big noise from both bands. It was like a weird Disney Land. RF.net: Any last comments to the fans? Mike: Anyways, we have a lot of fans here in Denmark and we respect Denmark a lot. You gave the metal scene a lot of things. We really hope to be able to come back soon, maybe we can even get to come back to Roskilde Festival!